August 19 feels like an eternity ago, but what was true then seems equally true today when we look at the top girls soccer teams in Class 5A. On that date, just over two months ago, Lone Peak’s Cameron Tucker got free behind the Davis defense and slotted home a goal about 30 minutes in that provided the Knights the advantage for their 1-0 win. The loss on Lone Peak’s field was one of just three suffered by the Darts over the course of the season. Now, Oct. 24 has come and these two juggernauts are headed to Rio Tinto Stadium to battle for the state championship – Lone Peak is 19-0 and Davis is 16-3. The difference between these two teams is about the size of that one goal, and the battle that ensues in the latter stages of Friday afternoon should be a game similar in style and score to that first one. As they fought to avoid their first loss of the season in August, the Darts put together a flurry of offensive activity in front of the Lone Peak net, but found out as 15 other teams have this season, that beating Knight goalkeeper Cassidy Smith is not an easy thing. To end the unbeaten run and hoist the trophy itself, Davis will need to solve Smith and keep a balanced Lone Peak attack from getting and capitalizing on the chances it gets at the other end. It figures to be a great final. 1) Accuracy at the net – It’s an obvious thing that in order to score, you must be accurate, but that takes on a whole new meaning when you are going up against Cassidy Smith between the posts. 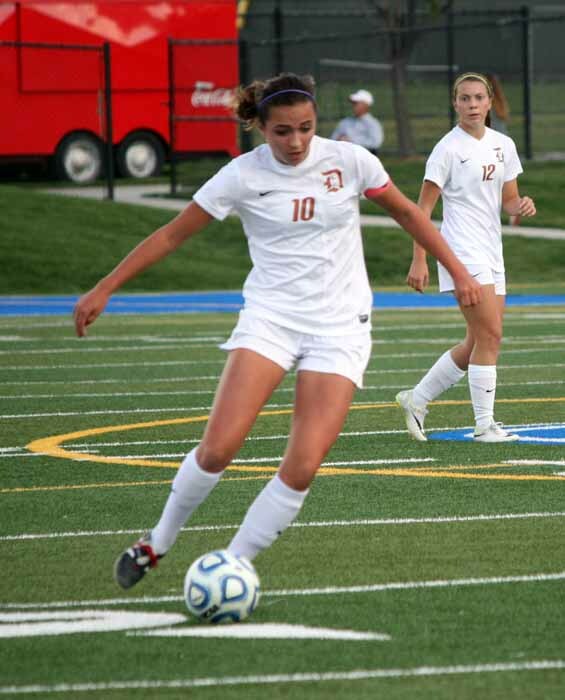 In their semifinal win over Brighton, the Darts were off target on a number of shots, but then they needed it most, with 12 seconds left, Ireland Dunn struck the perfect shot to the perfect spot. Against Smith, it’s not enough to put the shot on frame. When Davis gets a look at the Lone Peak goal, its placement must be to a spot the goalkeeper can’t reach. 2) Midfield play – With Smith in goal and Leesa Stowe anchoring a stalwart defense in front of her, the Knights are very good in that part of the game, but one of the reasons their back line is so strong is a hybrid formation deployed by head coach Heather Dahl, that utilizes a pair of defender/midfielders so that Lone Peak is often playing with five in the back, but transitions extremely well back into the midfield and its attack. The Knights need to win balls in the midfield to keep the game in the Davis end to be most effective, and the Darts have to contest everything in the midfield so that they can exert pressure on a Lone Peak defense that has allowed just five goals this season. 3) Ball movement – The secret to success for the Knights is player movement and a controlled short passing game. Lone Peak thrives on that and the build-up that it creates as it moves as a unit towards its opponent’s goal. Davis will need to disrupt that passing game by anticipating the movement of the ball, and for their part, the Darts have to resist the urge to spend a lot of time going one-on-one with their talented strikers. The more that Dunn, Madi Garlock and company move the ball themselves, the better it will be for Davis. 4) Goalkeeping – Lone Peak has an advantage here over all of its opponents, and in a game that will certainly see the occasional attacker breaking free for a shot on goal, somewhere along the way, a keeper will make a game-changing big play. In what is almost certain to be a low-scoring contest, this will be critical. 5) Avoiding that big mistake – Coach Dahl has seen her team knocked off of the state tournament the past few years because of what she feels is that one mistake. This one could very easily come down to that same scenario. One mistake in the wrong part of the field could lead to the goal that sends one of these two teams home with the big trophy. The 5A championship game kicks off at 4:30 p.m. Friday at Rio Tinto Stadium.